Last week we told you that the story Crouching Tiger, Hidden Dragon took its title from the characters, and that Jen Yu was the dragon part - for the tiger, we look to bandit Lo. "Lo" is his family name: his first name is Xiao Hu, which translates to "little tiger." So he's the tiger, she's the dragon, and suddenly it's no surprise that in the original novel, they're the main characters. 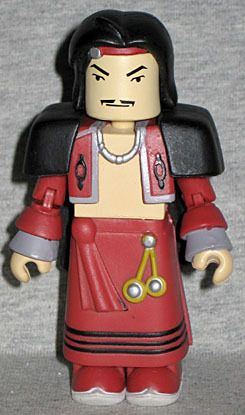 Lo - aka "Dark Cloud" - is the most ornate figure in this series. Or at least, his costume is. He has new boots with curled toes, a long skirt with black stripes painted near the bottom, a molded sash and a golden belt fob that's glued in place. He's wearing a short shirt that's open over his chest and has long, dual-layered sleevs. The chest cap is molded with a silver necklace, a flap over the shoulder and raised black details on the chest. Then, above that, he has a black shawl. He dresses in layers. His face is the most detailed in this series, as well. Of course, considering how simple everyone's facial paint is, all that means is that Art Asylum remembered to include his mustache - what, they were going to forget? Hardly. His hair is a new piece, hanging down past his shoulders, and he has a red headband with a silver disc on one side. The accessories are really nice. 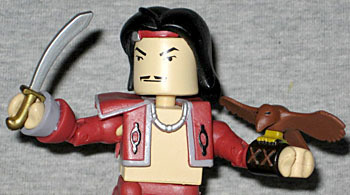 Lo comes with a tiny scimitar with a golden hilt, but that's not the impressive part. No, what really gets us is the falcon, which comes with its own separate falconry glove. The glove fits over the figure's forearm, so you have to take the sleeve off, but that's no problem. The bird's feet are permanently attached to the glove. 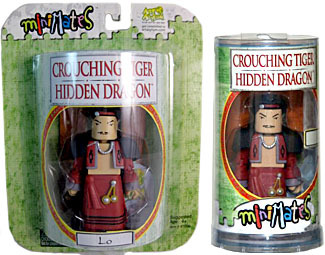 For some reason, Minimates used to have two separate styles of packaging. The figures were either available in a fully cylindrical tube, or on a half-circle blister card. Why the difference? Well, the carded ones were meant to be more "retail-friendly" (not that they were ever picked up by retail, other than a few Market Six places), but that does raise the question of why they didn't just make all the packaging retail-friendly. Why go to the trouble of designing two different styles for two different outlets? It seems unnecesarily complex. Of course, all my packaging just goes in the bin, so I don't care one way or the other. 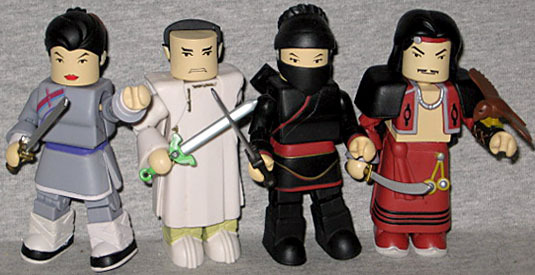 "(not that they were ever picked up by retail, other than a few Market Six places)"
Minimates in general, or just this series? Becuase I do remember seeing the Star Trek ones in Target.